Participants prepare for last year's Vasant Panchami festival at Regent Heights Public School on Pharmacy Avenue. This year's festival is set to take place at the school on the afternoon of Monday, Feb. 11. Photo: Submitted. 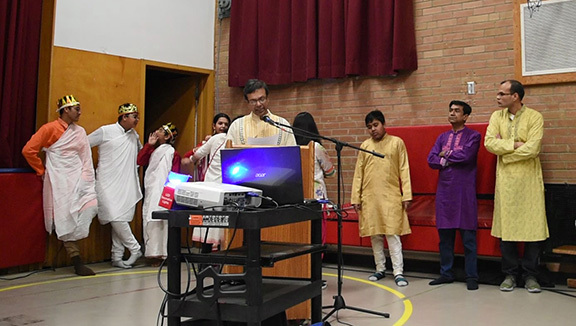 Regent Heights Public School is holding a Vasant Panchami festival to celebrate the goddess Saraswati. The celebration will be held on Monday, Feb. 11 from 3:45 p.m. to 5:45 p.m. in the school’s gymnasium. The two-hour program will consist of Saraswati prayer and meditation, followed by colourful cultural activities and vegetarian refreshments. The festival is to celebrate the Goddess of Learning, Saraswati. She is also known as the goddess for education, knowledge, music, teachers, poets and speakers. She originates from 5,000 years ago during the Vedic Period in ancient India. Her name means river or water which symbolizes the source of life, similarly to knowledge and learning. Saraswati is celebrated in South Asian communities all around the world. This is the second year for the festival’s collaboration with the community and Regent Heights Public School. The event is open to all, in hopes of attendees to learn more about the goddess and her teachings. Regent Heights Public School is located at 555 Pharmacy Ave.